Church History - One Week at A Time: That was the Week That Wasn't ! Absolutely nothing happened this week in church history! Well, not exactly... actually nothing happened this week in 1752. In fact, in 1752 this week didn't happen. If you're a computer geek using Unix or Mac OS X go into terminal and at the prompt type either "cal 9 1752" or "cal 1752" to confirm this phenomenon. If you're either not a geek or don't have access to one of these systems, click here for a screen shot of the results. What happened to the missing 11 days? I'll explain, but we have to go back a ways. As with most things in Europe the calendar has its roots in ancient Rome. The first formal Roman calendar consisted of a 304 day year divided into ten months starting with March. The first six were named after various gods, while the last four they simply called Month 7 (September), Month 8 (October), Month 9 (November), and Month 10 (December). January and February were added later. The calendar worked, but required frequent adjustments when the day of the year strayed too far away from the seasons with which they were associated. In an effort to correct things, Julius Caesar, following the advice of an Alexandrian astronomer, added an additional 67 days to the calendar for a total of 445 days. This one time adjustment (known as the Year of Confusion) moved the first day of the year from March to January. The next year was 365 days long with 12 months and leap year. It became known as the Julian calendar. As good as it was, there were however, some small inaccuracies and by 1545 astronomers had determined that a few minor adjustments were needed to sort out things like the date of Easter, which was calculated based on the spring equinox. So after some debate and a committee or two, a new calendar was developed that had 365 days to the year, and a leap year every fourth year, unless it was a century year (1700, 1800 etc) in which case it would only be a leap year if it were evenly divisible by 400 (1600, 2000, etc.). Pope Gregory XIII issued a Papal Bull (decree) that Thursday, October 4th, 1582 would be the last day of the Julian Calendar. The next day would be October 15th and the Gregorian Calendar was born. Well, except in Protestant countries. The Protestants, being Protestants, did what Protestants do - they protested! They refused to adopt the calendar proposed by the Pope for the plain and simple reason that it was proposed by the Pope! And as every good Protestant knows the Pope was the anti-Christ and was trying to steal 11 days from the people's lives!! Well, in some Protestant minds anyway. Eventually the Protestant governments began to realize they needed to be in line with their trading partners. Germany and the Netherlands came around in 1698, but it would be another 54 years before the British Parliament declared that Sept 3rd, 1752 would become Sept 14th. There was much protesting, and even rioting in the streets with the people accusing the government of trying to steal 11 days of their lives. Sound familiar? Some countries made a valiant attempt at using both systems and continued to do so right up until the 20th century. The accompanying picture is an example of the Old Style/New Style (OS/NS) system in use. 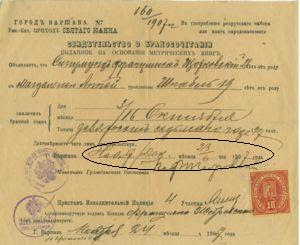 The date of the certificate (circled) reads "November/December 23/6 1907." In this system you were free to celebrate your anniversary on whichever of the two days you chose, depending on your viewpoint. Russia did not fully adopt the Gregorian calendar until 1919, and China waited until 1949. Even today Greek and Orthodox churches continue to use the Julian Calendar to determine the dates for Holy Days such as Easter And Christmas. The week that wasn't started on Sept 3rd, 1752 - 255 years ago this week... or not! 1. "calendar." Encyclopædia Britannica. 2007. Encyclopædia Britannica Online. 4 Sept. 2007 http://www.britannica.com/eb/article-59347. 4. Various other internet articles derived from searching "sept 1752"
September 1, 256: North African bishops decide that Christians who had recanted their faith under persecution must be re-baptized upon reentering the church. Stephen, bishop of Rome, disagreed with the vote and engaged in a heated debate with Cyprian, spokesman for the bishops. Eventually Cyprian yielded adding to the arguments for the Roman bishop's supremacy in the early church. September 2, 1192: The Third Crusade ends with the signing of a treaty. The purpose of this crusade was to take back Jerusalem which had fallen to Saladin (a renowned Muslim general) in 1187. Though they failed in taking back the Holy City, Richard I (who would later be crowned king of England) negotiated access to the city for Christian pilgrims. September 4, 1842: After a taking a 284-year hiatus (they started building it in 1248), construction of the Cologne Cathedral in Germany was resumed. Now a World Heritage Site, the cathedral was not completed until 1880. And you thought highway construction seemed to take forever! September 5, 1997: Mother Teresa of Calcutta, winner of the 1979 Nobel Peace Prize and founder of the Missionaries of Charity dies. Born Agnes Gonxha Bojaxhiu in Skopje, Macedonia this simple woman's work has been recognised and acclaimed throughout the world, and she has been an inspiration to millions. September 6, 1620: With 102 Puritan colonists (including three pregnant women) and approx. 30 crew members aboard, the Mayflower sails from Plymouth, England bound for the New World. After numerous hardships both at sea and upon their arrival in North America, the settlers would become known as The Pilgrims. September 7, 1823: Samuel Marsden, a missionary-pastor in Australia, is shipwrecked during one of seven voyages to New Zealand to share the Gospel with the Maori people.